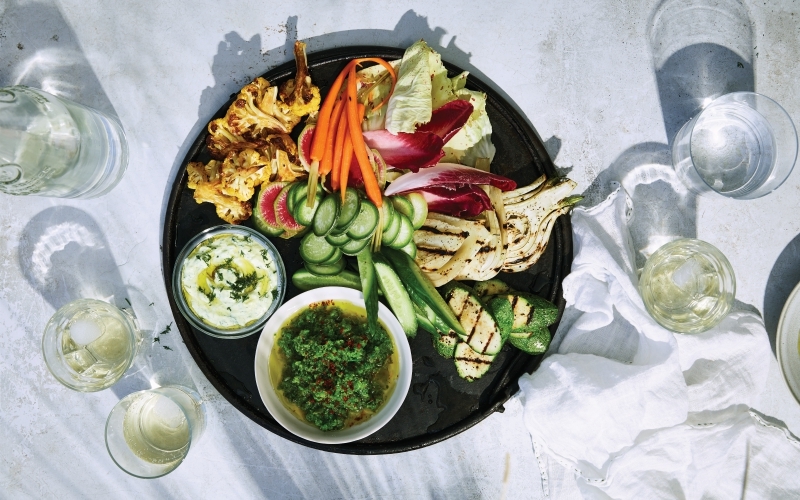 For most of us, the crudité platter, that health-minded staple of ’80s house parties and backyard barbecues, conjures images of carrots and celery sticks scattered around a tub of ranch. Yet in the right hands, those crisp vegetables (the word “crudité” means “rawness” in French) can become a dip-friendly vehicle for showcasing L.A.’s most impeccable produce. At Silver Lake’s Botanica, co-owners Heather Sperling and Emily Fiffer create seasonal rainbows of multihued cauliflower, purple daikon, watermelon radish, bright green sugar snap peas, and pale green romanesco. Magenta beet spread and spiced labneh used for dipping add a burst of color and flavor. In the Lobby restaurant at the NoMad hotel in DTLA, young carrots, pink radishes, and fennel slices jut from a bowl of crushed ice. And the pretty plates at P.Y.T., Josef Centeno’s veggie-forward spot downtown, might feature an array of fruits like kumquats and mandarins perfectly interspersed with kale, spigarello, and sprouting broccoli. Despite the colorful panache, the produce in question is often prepared with little adulteration: wash, cut, and serve. But sometimes appearance belies technique. At Chinatown’s Majordomo, David Chang lends vibrancy to his Bounty Bowl by spraying raw greens with kelp-seasoned water to make them glisten. One thing everyone agrees on: Freshness is paramount. If there’s a trick to making diners comfortable with shelling out $15 for a spread of beautiful rabbit food, it might involve conveying a sense of place, or at least channeling the agricultural gusto that defines the Golden State.